As Sukkot (and my vacation) draws to a close (ok, there’s a few more days left) I’d like to leave you with a recipe I developed for a meat-free Sukkot menu for the Jew and the Carrot. Sukkot is one of those rare Jewish holidays that doesn’t have prescribed dishes and while it’s all about the harvest, many still include meat on their table. I propose a vegetarian Sukkot to truly celebrate the harvest. This comforting, Moroccan-inspired tagine is so hearty it will satisfy even the most carnivorous guest or family member. The best part about making this dish was that I finally got to use the beautiful tagine that Beth got me for my birthday back in June! Isn’t it just gorgeous? This one is just for serving, but the tagine (confusing as it is the name for both the vessel and the recipe) comes together easily on the stovetop with no fancy equipment. I used butternut squash, sweet potato, and carrots for a comforting, fall dish but many other vegetables would work beautifully as well. This vegetable-packed tagine is hearty and aromatic. Dried apricots provide just a hint of sweetness and practically melt into the dish. The recipe makes plenty, and reheats beautifully. I love tagine, and this one looks spectacular!! Thank you Giulia!! I love tagine too, so versatile! Oh I’d love to try Tagine! How sweet of Beth to give you this beautiful Tagine. I always look for a serving bowl/container for rice. This is a very good looking one! Enjoy the rest of your vacation! I bet you would love tagine Nami! It really was the sweetest gift ever. Beth knew I had my eye on it and surprised me 🙂 Thank you Nami! Vacation was just wonderful. Everything looks fabulous: the recipe, the pictures, and the tagine! Enjoy the rest of the holiday and your vacation! A LONG time ago I used to live in Morocco – so I know tagines (both the vessel and the dish). Your tagine (vessel) is one of the prettiest I’ve seen. Your tagine (the dish) is also one of the prettiest I’ve seen! Great, light modern version (meaning much less oil than a traditional tagine). Good recipe. And welcome back! That is so cool!! Morocco is one of the places I most want to visit in the world. I thought it would be so easy and cheap from Israel, but not so. Luckily we have tons of Moroccan influence – including awesome tagines like this! Thank you so much for your kind words, I’m flattered! Looks so warming and very harvest-worthy meal! I love your tagine dish! Very colorful. Thank you Ilke! I love my tagine dish too – isn’t she purdy? 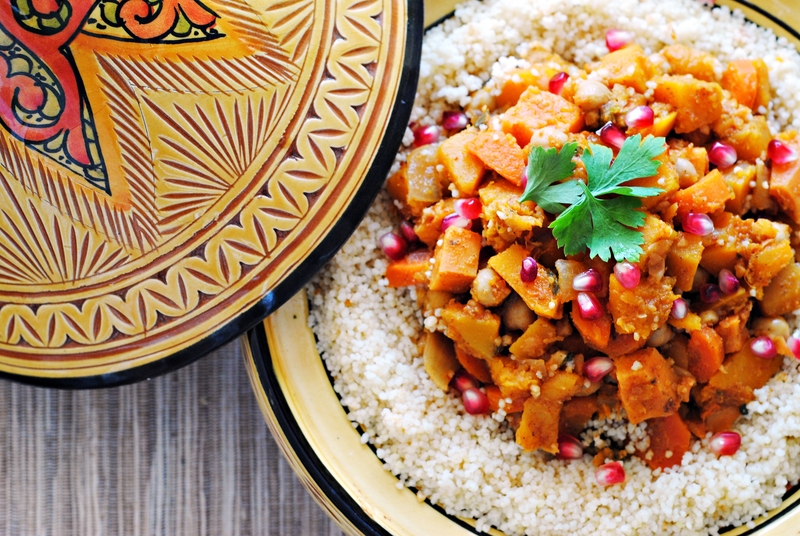 What a gorgeous tagine (both the recipe and dish)! I can’t resist anything with sweet potatoes and squash. Welcome back – I hope you ate well, relaxed and had fun! Lovely recipe – all of my favorite things! Gorgeous tagine & looks yummy! Can’t wait to hear all about your vaca!! The recipe looks amazing and the pictures are out of this world! Aw thank you so much Ruth! This came out very nicely for me as a contribution to a potluck. Thanks. That is so wonderful to hear!! Thank you so much for letting me know. You’ve made my day! What a gorgeous tangine and dish! I love all the beautiful colors and spices in this dish. It must be so tasty and flavorful! Ooh, tagine. I’ve been missing those since my trip to Morocco way back when, I really need to get mys hand on one and experiment with it. This looks wonderful! I am absolutely dying to get to Morocco!! Some day. It’s up there. The great thing about tagines is they don’t *need* to be made in a tagine, I just made this one on the stove top! Really? Oooh, now I’m hooked! Oh that looks like such a delightful dish. Love the colors. Congrats on T-9! Thanks so much Lori! I was thrilled to be included! Gorgouse tagine dish! Love it! Oh and the actual tagine is mouth watering! What’s not to love about butternut squash and sweet potatoes. This tagine was fantastic! Easy to make, tasted great, lots of leftovers – basically anything I could have hoped for. I am so glad I stumbled upon your recipe! Oh Jillian, you have made my day! Thank you so much for reporting back and letting me know that it came out well! I am thrilled to hear it. it. Photos ate stunning as well! pomegranate seeds in tagines = the greatest thing. this looks terrific! and your tagine dish itself is really beautiful, i want one just like it. I agree! Pomegranate seeds add just the right tangy sweetness, and they’re so pretty! Thanks! I love that dish. This was just phenomenal. I followed the recipe exactly (with the exception of the pomegranate seeds) and my partner and I loved it. It reminded me of a tagine I had years ago but could never recreate. This recipe is definitely a keeper! Would you mind asking your friend where she bought it? She must really love you to give you such an exquisite gift! PS. I’m going to try some of your recipes. I’ll let you know how they turn out. Thank you for your note! I hope you enjoy my recipes 🙂 I absolutely adore my tagine, she really is a great friend! Beth got it at our favorite Moroccan shop in Tel Aviv. I don’t know where you are located, but if you’re in the area it’s called “Oriental Design” (although I never knew the name and don’t know that it’s posted anywhere) and it’s on 8 HaShomer, right off Binyamina behind the Carmel Market. Lucky you, living in Israel. I’m stuck in suburban Chicago, but I’m all-but-certain my youngest will eventually make aliyah. Meanwhile, I will have her go to Oriental Design the next time she’s in Tel Aviv, which very well could be this year. I won’t have to twist her arm; she loves the markets in Tel Aviv and loves buying stuff for me! I tried to find the shop online to see whether they have a purchasing web site, or even a mailing address or phone number, but could find nothing. I discovered your site last night and had fun perusing your recipes–you are quite prolific! It would take the rest of my life to try all your dishes–so I guess I’d better get started. After Pesach, of course. BTW, the button below for notifying your fans of follow-up comments via e-mail apparently didn’t work, as I didn’t receive any such e-mail. I found your reply by returning to your site. My bookgroup raved about this! Hi I made this as we are trying to to vegiterian one day a week (though we are very new at this and dont know what to cook). It was easy and SO good.. i just used to little chili as my son joined in for supper… and enjoyed it too! (that is thumbs up for you as he is a fussy eater). I didnt have apricots and used some dried mango and used cranberries at the end as a substite for the Pomegranate seeds – NJAM!! I made this tonight and it was delicious! I did not have enough apricots so used golden raisins as well. Perfect balance between sweet and spicy. I do think that 3 cups of couscous was too much, and I expected to actually cook this in my tagine but as I read through the recipe I realized that was not so. Still, my husband and I loved this and we served it with sauteed spinach on the side. Thank you for a great recipe!! I’m so happy you liked it!! Yes, 3 cups of couscous is a lot but we do manage to serve a lot of people with this meal and still have leftovers. I think you could totally cook this in a tagine – I just don’t have a proper cooking one so had to try another method. Sauteed spinach sounds like a great side. Thanks for your comments! I absolutely love this tagine. I did not follow the recipe 100% as I hate cilantro. Instead I used more parsley. I also did not use red pepper flakes but fresh chilli instead and more garlic. Really hearty and warming dish for cold weather. They sound like lovely substitutions – I’m so glad you enjoyed it!!! Stay warm! The lemon killed it for me. I’d use dark honey and harissa, just as I do for meat tagines. I’d also use half the vegetables or add more water. Sorry to hear that, but great suggestions! This looks delicious! Planning to make it for my book club this week. I noticed that the amount of cilantro and apricots is not listed — does anyone know how much to use? Thank you! Oh dear it looks like the amounts were cut out for some reason. I’ve fixed it in the recipe, but it’s 1/2 cup dried apricots and 1/4 cup chopped fresh cilantro. Sorry for the delayed response, I hope you enjoyed it! I’ve made this recipe a number of times now and it never fails to deliver on taste. Absolutely brilliant – thank you! This looks great, I can’t wait to try it. I received a tagine as a gift. It is one you can cook in. Do you know how/if you could adjust this recipe to make and serve it in a tagine? I made this for my Moroccan husband, and he couldn’t stop raving about it. I used to live in Morocco, so I make him tagine a lot. This was his all time favorite. He gave it a 10! Hi! I hope you’re still reading these comments! This looks wonderful! I just got a tagine and would like to use this as my first recipe, but I’m confused, where does using the tagine come in? Do you use it instead of a large skillet? Hi Kate! Sorry for the slow reply – apologies for the confusion. This recipe can absolutely be made in a tagine, though I’m not 100% sure of cooking times. Back when I got mine I was disappointed to learn that there are decorative tagines and cooking ones and mine is purely decorative. So I had to come up with alternative solutions, which is why I used a skillet instead. A tagine will surely get an even better result! Do keep us posted. thanks for sharing out this recipe – this hit the spot as I was looking for a tagine featuring Butternut Squash and sweet potato, and I actually had everything else needed as well, so yay ! Several people asked about cooking this on an actual tagine dish, and I used the recipe to fire up my own (cooking) tagine. I’ve not used it very much, but it is a kind of memory of a great trip into the deep South of Morocco (starting in Marrakesh and ending in the Sahara desert) a few year back. – make sure you have a cooking tagine rather than a display one. – I’ve seen people suggest to use heat diffuser, though I’ve not actually used one myself. – just keep heat low, once the tagine is warmed up. – an important point, which I semi-forgot this time – use less cooking water than specified for cooking the veg. I used about 1/2 the amount in the recipe and that was still a bit too much. The tagine is magic for preserving water via the cone. -mine is a fairly standard size tagine, and I found it difficult to get all the veg ingredients in. What I did was : coat the veg in the paste/sauce in 2 batches. Then return coated veg to tagine using a layered approach. My wife reminded me of how she had seen this done in Morocco : piling up the veg so the largest chunks are in the bottom with smaller pieces on higher layers sitting inside the cone. Once it is all loaded, keep it on a low heat, it will take longer than the time specified in the recipe, but not too long, and the result, in my experience was delicious ! Apart from that I followed the recipe pretty faithfully. Slight cheat was to used a jar of readymade harissa paste ; I used 2 tablespoons of that instead of the tomato paste + chilli powder + cinnamon combination. I would agree with the estimate of 6 – 8 portions; it can be hard to judge, because I guess it depends on how large a ‘butternut squash’ is, likewise sweet potato, to say nothing of how large a portion is. Served 4 for supper this evening with 2-ish leftover portions for a school/work lunch later in the week.